Believe it or not, this is the first time I’ve heard of Underworld despite it being the fifth instalment of the series. Thanks to Sony Pictures, I got to watch the film with from the perspective of a “newbie”, together with a group of other friends. Starting with a little narrative recap by Selene (Kate Beckinsale), it wasn’t a difficult story to follow if you have any notion of the Twilight story. The werewolves and the vampires were at odds, Selene the Vampire Death Dealer is the odd one after falling in love with a lycan-vampire hybrid and gave birth to a child, Eve. The story continued off from how she was still on the run, hunted by both the werewolves and the vampire for the blood of her child – the first ever hybrid of all three types of Immortal, Vampire and Lycan. Perhaps it was the lack of knowledge about the film, it was difficult for me to feel emotionally invested. The actors were professional, but the Underworld universe felt oddly modern (with weapons and machine guns), and medieval (with the vampire clans’ outfit and castle). The lines seem to be blurred between sci-fi and fantasy story, so unless we accept the story as it is, it will be easy to get caught up in the odd plot holes. An obvious example was how Selene could easily be spotted via surveillance camera when she has managed to escape the clutches of her enemies for over a decade. According to friends who had followed the previous films, there were less action this time. putting aside the fact how Varga (Bradley James) was able to switch sides so quickly and go against Semira (Lara Pulver), the finale fight was pretty interesting. One particular noteworthy scene would be the confrontational gun fight between vampire David (Theo James) and lycan leader Marius (Tobias Menzies). Funny as it was, it somehow fulfilled many fans’ oddest fantasy of having an action scene where both parties are being immune to gun shots. Fans of Beckinsale should prolly catch it to be updated with Selene’s achievements, after all, it’s not often you get a “vampish” emotional heroine on screen. 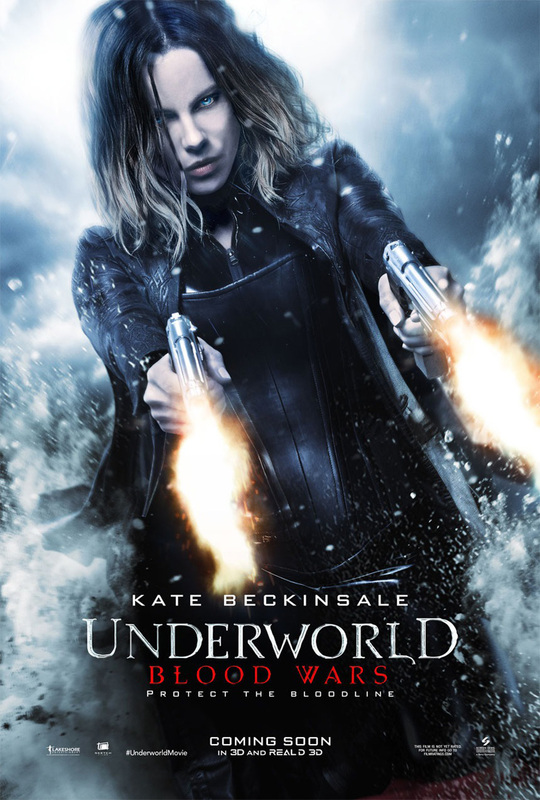 It is the fifth installment in the Underworld franchise and the sequel to 2012 film Underworld: Awakening, with Kate Beckinsale reprising her role as Selene. Anna Foerster signed on to make her directorial debut with the film, being the first woman to direct the film in the series. This movie contains 4 cast members from the Game of Thrones (2011) universe. This includes Charles Dance (Thomas) who portrayed Tywin Lannister, Tobias Menzies (Marius) who portrayed Edmure Tully, James Faulkner who portrays Randyll Tarly and Lara Pulver (Semira) who voiced Lady Elissa Forrestor in Game of Thrones: A Telltale Games Series (2014). Check out Underworld: Blood Wars Facebook Page! Underworld: Blood Wars is out in cinemas on 1 December 2016. *Disclosure: Invitation by Sony Pictures Singapore. No monetary compensation was received for the movie review. I’m a total fan of this movie, including the previous ones. I’ve watched all Underworld films, they were great and so is this. I watched it and I liked it. When it comes to Theo James, I just have to watch that movie. Had not seen the first installment but now waiting for sequel. I haven’t seen any of the films in the series as fantasy/sci-fi flicks are not quite my thing. As always you did a great job with the review. I might reconsider. I’ve actually followed Underworld even if its a bit dark and edgy. I’ll check this one out too. I’ve only seen one of these, the first one. I can’t say I like it but I don’t really hate it. I think it’s just not my kind of movie. Haven’t been a big fan of vampire movies. Haven’t seen the Underworld movies as well as Twilight saga… Anyways, good to know that there are familiar GOT faces in this movie. I did not see any of the past Underworld films. So I gave this sequel a pass. I did like the use of Guns and Roses music in its trailer though.